Copyright - all rights reserved Tara Maxwell 2017 - 2018. If using resources from this website my videos or my blog to sell or attract custom to your buisness please credit my work by referencing this website & my name. Thank you. 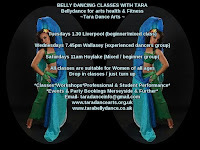 When I first started to learn belly dance I was a young single mother on benefits who could hardly afford to pay for classes let alone costumes and props. One of my best friends who's grandmother is Egyptian gave me the idea of making my own. She knew I was creative and was always making old things look glam new & unique. So I went ahead and got a humble garden cane and some cheap fabric and made my own to match the gorgeous pink costume I made. These days I am lucky enough to be in a better position and have several professional Canes that are nice but to be honest they don't get the same compliments my home made ones did. I still make canes to use at class and often give my students them to keep. I originally wrote this article in September 2017 for my beauty blog. See the link at the bottom of this page. This is quite an easy to follow tutorial on how to make an Egyptian belly dance cane. There is no substitute for a professional authentic cane whilst performing professional however these are great for student dancers and teachers who teach their students cane dancing. They are light weight look great and cost next to nothing to make, Plus they do t take long to make. These are a great must have for a belly dance teacher's kit. Enjoy getting creative!! News paper or a dust sheet (to protect the service you are working on. 4- Start by painting glue to the end and about 30cms (a ruler size) down. Get a price of the fabric and fix the widepth of the end of the fabric over the end of the cane. Hold in place and start to roll the cane whilst wrapping the fabric around and down. Have you cane at an angle and pull the fabric taut. 5- Carry on paining the glue and fixing the fabric to it using the technique explain in step 4. 6- when you come to the end you want to follow the instructions from step 4 by fixing the end. Follow by paining hlue over the fabric on the opposite end to where you started and wrap fabric down again over the fabric. About 30 CMS. 7- Fix a peg to the end to hold it in place if you need to. 8- End with painting over the fabric of the whole cane and stand up and leave to dry. 9- once dry remove the peg. 10- Watch the video for a more in depth tutorial. Link to my beauty blog where this article was originally posted in September 2017.